Flower essences are botanical medicines made from wildflowers. They were first developed by Dr. Edward Bach, a British bacteriologist, in the 1930s. After years of research, he discovered 38 flower-based remedies and recommended them for helping patients restore emotional balance. Since that time, further research has been done and hundreds of other flower remedies have been classified. In my practice, I find flower essences very beneficial when applied topically from the stock bottle in a variety of non-oral ways. Today, I want to share the following treatment taken from the book, Floral Acupuncture, by Deborah Craydon, C.F.E.P., & Warren Bellows, LIC. A.C. This is a treatment for opening not only to your destiny but also to passion for your destiny task in life. 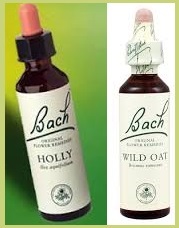 You will need Holly & Wild Oat Flower Essences ( I recommend Bach), a bowl of 4-6 ounces of water, and cotton balls. Due to the energetic nature of flower essences, it is important to not let the glass dropper touch anything other than the flower essence itself in order to keep the essence as potent as possible. 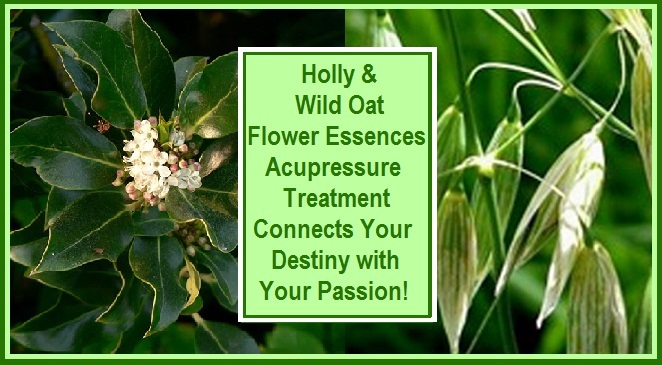 Holly & Wild Oat Flower Essences are applied directly to the Governing Vessel 4 acupressure point known as the Gate of Destiny. This acupressure (acupuncture) point is where the Element of Water (Wild Oat) ascends and the Element of Fire (Holly) descends. This is a treatment for opening not only to your destiny but also to passion for your destiny task in life.